Two of the top-selling brands of jerky treats for pets will soon return to U.S. store shelves, a year after a nationwide recall and with government experts no closer to solving the mystery that has linked the products to hundreds of animal deaths and thousands of illnesses. Nestle Purina Pet Care officials say they’ll reintroduce a line of Waggin’ Train treats for dogs starting next month, including products made from a single supplier in China and new products sourced entirely in the United States. “We’ve worked hard to put in place the highest quality controls in the dog treat industry,” Waggin’ Train President Nina Leigh says in a promotional video. And Del Monte Foods Corp. officials said they’ll resume selling Milo’s Kitchen Chicken Jerky Strips and Chicken Grillers Recipe treats in March using U.S.-sourced meat. Federal Food and Drug Administration officials told NBC News they know about Nestle Purina’s plans and have reviewed them, but they said the company doesn’t need special permission, known as pre-market approval, to reintroduce the treats. And they said they couldn’t discuss the review. “As with all meetings that might include discussion of proprietary business information, the content of these meetings is confidential,” spokeswoman Juli Ann Putnam said. That’s despite repeated FDA warnings that consumers should avoid jerky pet treats after the agency received reports that since 2007, nearly 600 pets, mostly dogs, have died and 4,500 have been sickened after eating chicken, duck and sweet potato products made in China. That figure is up by 900 reports since October. The move drew immediate criticism from veterinarians, pet owners and animal advocates, who said it wasn’t clear exactly what changes, if any, the companies made to the products, and that they were worried their return to market would only sicken more pets. Florida veterinarian Sofia Morales, who has treated at least three cases of Fanconi syndrome, a serious illness linked to the treats, said she would want to see results of clinical trials in pets showing that the revamped products were safe. “Right now, what I’m recommending to people is not to feed jerky,” she said. Jerky makers have consistently said there is no proven link between their products and the pet poisonings. FDA officials have not demanded recalls because they have no proof of contamination. Nestle Purina officials said they have made “significant enhancements” to the Waggin’ Train production process, including limiting meat sourcing to single suppliers and requiring that each batch be tested for a range of contaminants, including salmonella, melamine, di-ethylene glycol and antibiotics, as well as heavy metals, pesticides and mycotoxins, or molds. Nestle Purina and Del Monte, the nation’s top two jerky treat suppliers, pulled the products from market across the country a year ago after New York state agriculture officials said they detected low levels of unapproved antibiotics in the treats. The firms said the antibiotics weren’t linked to the reports of pet illnesses and deaths, and that the drugs were approved in places outside of the U.S.
After the recall, however, reports of pet deaths and illnesses continued to come in, but at a much slower pace, a trend FDA officials said was likely caused by simply having fewer products on the market. In October, the FDA sent a letter to the nation’s veterinarians asking them to track and send detailed information – including physical samples – from any pets that appeared to be sickened by jerky treats. FDA scientists have conducted scores of tests since 2007 to try to determine what’s behind reports of gastrointestinal illness and kidney and urinary problems, including at least 135 cases of Fanconi syndrome, a dangerous type of kidney disease – all to no avail. Between January and November last year, the FDA refused five lines of jerky-style treats at the nation’s ports and detained another 260. The agency has not responded to NBC News public records requests for the details of those actions. Tony Corbo, a lobbyist for the advocacy group Food & Water Watch, has been an outspoken critic who says the FDA hasn’t done enough to address the jerky treat problem. Schopp, the Nestle Purina spokesman, said the firm has detailed the steps it took make products safer at a new Waggin’ Train website. He said they’re bringing products back to stores at customer request. “We’ve heard from thousands of consumers,” he said, adding that it’s important to feed the treats as directed. Still, one former jerky pet treat fan isn’t convinced. 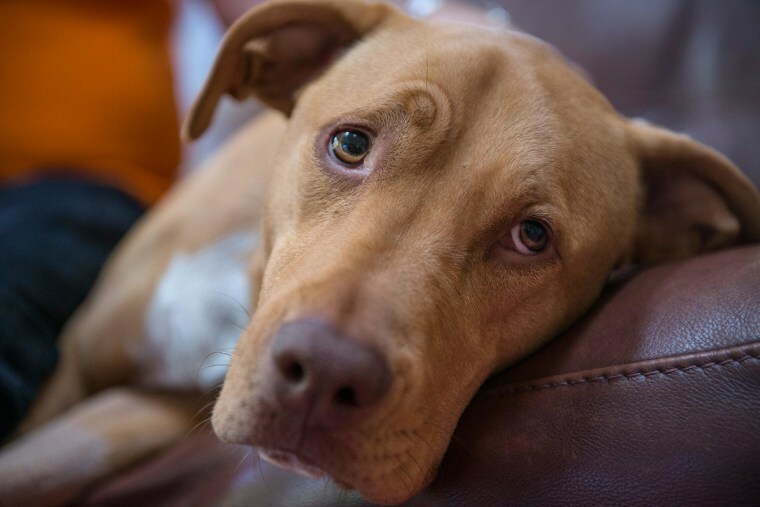 Ron Barnhard, 65, of Parkland, Fla., nearly lost Zoe, his 3-year-old pit bull mix, last year when she developed Fanconi syndrome her vet said was tied to eating jerky treats.